Over/Under: Over 150.5 at 1.90 Bet Now! It is second top versus second bottom and with the hosts already qualified for the playoffs and the away team out of the running for the playoffs, this game may seem as though there isn’t a lot riding on it. This isn’t the case though and this could be a game that provides plenty of action and excitement. While Lokomotiv would be forgiven for downing tools this week after clinching a playoff spot last week, they know that they can make their Top 16 experience even better. This is because they have the chance to book second place in Group E and the home court advantage that goes with it. If they are looking to do so this week, they need to win and hope that both Panathinaikos and Crvena lose. There is not much Lokomotiv can do about the other results but they can certainly take care of their own responsibilities in this game. The win last week not only pushed Lokomotiv into the playoffs, it broke a two game losing streak. The Lokomotiv defence has been the best defence of the season so far, allowing an average of 68.6 points per game. Unicaja Malaga are experiencing a torrid time at the moment and they have managed to lose eight of their last nine games. There is also the fact that they have the worst attack in the Top 16, only averaging 70 points per game. With this poor level of return, it is no surprise to see them struggling so much and Unicaja may be looking at damage limitation for this game. They were defeated by 18 points in Malaga and they don’t want to experience another mauling like that. The pressure may be slightly off both teams, which could push Malaga into a better performance but the away side will be keen for the Top 16 to be over as quickly as possible. The bookmakers believe that the hosts will control this game from start to end and it is difficult to argue with that reasoning. 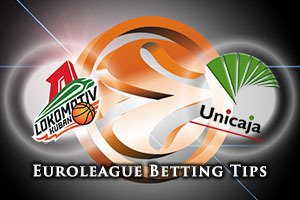 Taking Lokomotiv Kuban Krasnador at -12.5, at odds of 1.90, is likely to be a decent bet for this midweek. For the Over/Under market, look to go OVER 150.5. at odds of 1.90. Bet Now!